is a landlocked country in Central Europe. The Czech Republic covers an area of 78,866 square kilometres (30,450 sq mi) with a mostly temperate continental climate and oceanic climate. It is a unitary parliamentary republic, with 10.6 million inhabitants. The Czech Republic is a member of the European Union (EU), NATO, the OECD, the United Nations, the OSCE, and the Council of Europe. The Czech Republic includes the historical territories of Bohemia, Moravia, and Czech Silesia. 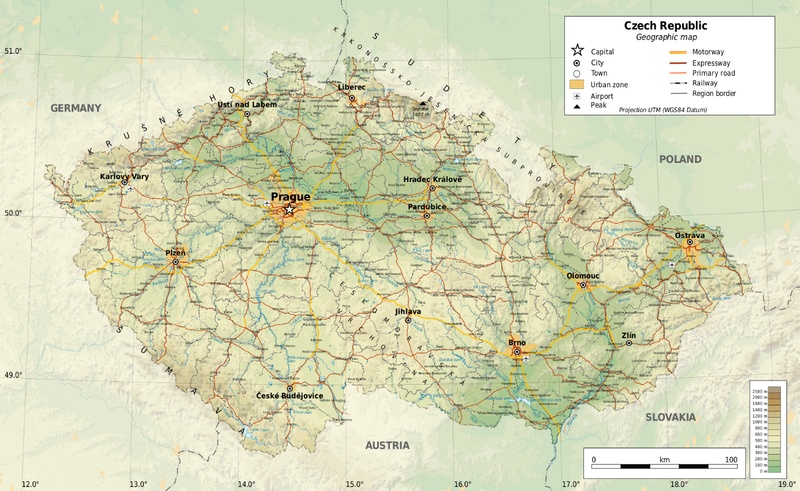 The Czech state was formed in the late 9th century as the Duchy of Bohemia under the Great Moravian Empire. After the fall of the Empire in 907, the center of power transferred from Moravia to Bohemia under the Přemyslid dynasty. In 1002, the duchy was formally recognized as part of the Holy Roman Empire, becoming the Kingdom of Bohemia in 1198 and reaching its greatest territorial extent in the 14th century. Besides Bohemia itself, the king of Bohemia ruled the lands of the Bohemian Crown, he had a vote in the election of the Holy Roman Emperor, and Prague was the imperial seat in periods between the 14th and 17th century. In the Hussite Wars of the 15th century driven by the Protestant Bohemian Reformation, the kingdom faced economic embargoes and defeated five consecutive crusades proclaimed by the leaders of the Catholic Church.